These Terms and Conditions for the Provision of Services (hereinafter, the Terms and Conditions) apply to all the orders made to Okodia SLU (hereinafter, Okodia) by the Customer and constitute a legal contract between the Customer and Okodia regarding the performance of translation/proofreading/localisation/layout services. Should the parties expressly work under certain Specific Terms and Conditions, the provisions in said Specific Terms and Conditions shall prevail above those in General Terms and Conditions that conflict with them, with the rest of the terms and conditions remaining unchanged. The potential invalidity of any provisions shall have no impact on the validity of the other provisions. The customer’s General Terms and Conditions shall only apply after express acceptance in writing by Okodia. From the first Order, the Customer shall be understood to accept the General Terms and Conditions with no need for later confirmation, unless a change in them took place within the stipulated period. In this case, the General Terms and Conditions shall be provided again to the Customer for acceptance. Delivery of Original Materials entails the Customer’s acceptance of all the General Terms and Conditions. Acceptance of the price quote provided by Okodia entails acceptance of the order as well as of the General Terms and Conditions. – Okodia: means any of the Okodia SLU brands, as well as its internal employees and authorised external partners. – Customer: means the person, company, organisation, etc. that orders or pays the work, or the person representing a company, organisation, etc. – Translation: means the transfer of a message in a Source Language into an equivalent message in a Target Language, following professional good practice in the industry. Translation is performed by a single native professional translator and includes a self-proofreading by the same translator. It does not include proofreading by a different professional translator. – Proofreading: means the re-reading and review of a Translation in order to identify and correct potential mistakes in the Target Language with respect to the Source Language. Proofreading is performed by a professional translator other than the translator who performed the Translation. – Localisation: means the transfer and adaptation into a specific culture of a message in a Source Language into an equivalent message in a Target Language, following professional good practice in the industry. Localisation is performed by a single native professional translator and includes a self-proofreading by the same translator. It does not include proofreading by a different professional translator. – Translation + Proofreading: means the combination of Translation and Proofreading. This service is provided in accordance with standards ISO 9001 and ISO 17100. – Layout: means the spatial arrangement of written and graphic contents (the graphic aspect of publishing). – Translator: means an Okodia internal professional employee or external partner in charge of performing the Translation, Localisation, or Proofreading. – Sworn Translator: means an Okodia internal professional employee or external partner in charge of performing the Sworn Translation. Sworn Translators are certified by the Spanish Foreign Office or the equivalent organisation. – Layout Designer: means an Okodia internal professional employee or external partner in charge of performing the Layout. – Source Language: means the language in which the Original Materials are written. – Target Language: means the language into which the contents of the Original Materials must be transferred, resulting in Final Materials. – Original Materials: means the documents and other materials delivered to Okodia to perform the translation/localisation/proofreading services under these Terms and Conditions. – Final Materials: means the final translated/proofread/composed version of the Original Materials. – Urgent: pertains to those orders to be delivered within 24 hours or less or which involve work or delivery at night, during holidays, or during the weekend. Calculation will be based on blocks of 1,800 words/business day. Urgent Translation is performed by a single native professional translator and includes a self-proofreading by the same translator. It does not include proofreading by a different professional translator. – Sworn: pertains the certification of a Translation by a Sworn Translator certified by the Spanish Foreign Office or the equivalent organisation. Sworn Translation is performed by a single native professional translator and includes a self-proofreading by the same translator. It does not include proofreading by a different professional translator. Price quotes are for Okodia’s services are free and entail no commitment. The period of validity of the price quote and other specific considerations regarding the order. Unless otherwise specified, rates do not include taxes or reimbursements for delivery costs, taxes, accommodation costs, travel costs, etc. Okodia shall perform the stipulated service and invoice it in accordance with the terms and conditions and the prices specified in the quoted price. Promotional offers are not cumulative and shall not apply to other discounts. Any offers or prices confirmed outside the validity period specified in the price quote shall not be regarded as binding for Okodia, unless otherwise specified. Okodia reserves the right to change the prices and rates as well as the estimated delivery date specified in prior price quotes after reception and assessment of the full Original Materials. Okodia shall inform the Customer of any additional cost or change in the delivery date before starting to work on the Order. All orders shall be confirmed in writing by email or, on an exceptional basis, by telephone, and shall include all the information and materials of reference required for correct performance of the service requested (such as glossaries or specific technical vocabularies, style books, images, target audience, target country, etc.) Should the Customer fail to inform Okodia about any of the main aspects of the service, he shall not be entitled to any discount or compensation for potential deficiencies derived thereof. Should Okodia not receive confirmation of the price quote, Okodia reserves the right not to start work on the Order. Should confirmation of the Order not be received within the period of validity of the budget, Okodia reserves the right to regard said price quote as invalid and calculate a new price quote. In the event of existing clients that do not need a previous price quote, or in the event of absence of previous price quote, all orders shall be carried out according to the previously agreed rates or previous rates established in previous similar price quotes. The delivery date for the order specified in the price quote shall start from the acknowledgement of reception of the confirmed price quote provided that Okodia has received all the Original Materials through the agreed medium. The Customer declares and guarantees that a) the Original Materials are its property or he has the right to use or transfer it; and b) the translation of the Original Materials and the publication, distribution, sale, or any other use assigned to the Final Materials does not breach any copyright, trademark, patent, confidentiality agreement, or other third-party rights, and thus shall be used exclusively for lawful purposes. Provision of the Service includes the service explicitly included in the Service section in the price quote and delivery of the Order by email or through the agreed medium in every specific case. Should non-editable Original Materials not be received, the order shall be delivered in a format that is as close as possible to the Original Materials. For order which, due to their characteristics and at the request of the Customer, required layout work, the Customer shall provide the corresponding source files together with the editable Original Materials. During the layout review stages, communication between Okodia and the Customer should be smooth. The Customer should remain locatable and available to Okodia in order to ensure that the delivery deadline is met. The delivery deadline shall be binding only after explicit confirmation in writing by Okodia. Times are given for the time zone in Peninsular Spain (CET). Should Okodia be unable to meet the delivery deadline, it shall inform the Customer within a reasonable time, as soon as possible, and shall set another delivery deadline with the Customer. Delivery shall be regarded as having taken place when it can be proven in accordance with the medium selected (physically or by email) and when it has reached the agreed destination. The delivery deadline shall be regarded as not having been met when delivery is delayed by more than 24 hours (12 hours for Urgent Translations) and the Customer has informed Okodia of the situation in a manner that is provable by email or telephone sufficiently in advance. In the event of a delay of more than 24 hours, provided that said delay is directly and exclusively attributable to Okodia and no agreement to change the delivery date with the Customer has been reached, a refund shall be made, as stipulated by the parties, for an amount equal to or lower than 100% of the delayed work. Under no circumstances shall Okodia be liable to any delays due to force majeure or circumstances not attributable to Okodia, including a disease, accident, or temporary incapacity of the work team, a malfunction in the fax, email, or other postal or terrestrial media not directly under Okodia’s control. Likewise, Okodia shall not be held liable for any delay in delivery due to a delay in delivery of the Original Materials due to their not being in the right format or to their not having been delivered by the Customer within the agreed period. Should the Customer request a modification or addition to the Original Materials during the performance of the Order, the Customer shall immediately give Okodia clear instructions in writing about the changes to be made and their position with respect to the copy previously sent. As soon as possible, Okodia shall inform the Customer about the impact in terms of cost and time required to make the modifications or additions to the Original Materials, which will be calculated on the basis of the number and nature of the changes, as well as the Order volume already completed. The Customer shall assume the cost of said modifications or additions. In the event of breaches by Okodia or the Customer, either party shall be entitled to cancel the Order, notifying the other party in writing. Moreover, the Customer shall be entitled to cancel the Order at any time and for any reason, notifying Okodia in writing. If an Order is cancelled, the Customer shall be obligated to pay Okodia 100% of the cost corresponding to the services completed at the time of cancellation of the Order. As regards the remaining time, Okodia reserves the right to apply a discount or invoice the total amount agreed, on the basis of the work to prepare the non-completed portion, the time and resources reserved for performance of the Order, delivery costs, or other extraordinary expenses or damages and losses resulting from cancellation. Okodia shall also be obligated to return to the Customer all the Original Materials and data received, as well as all the Final Materials existing at the time of cancellation. Okodia reserves the right to retain the Original Materials and the Final Materials as a way to guarantee payment by the Customer of the full amount of the debt. Okodia shall not be held liable for any inconsistencies, ambiguity, low quality, misspellings, inaccuracies, etc. in the Original Materials. The Customer shall be exclusively responsible for verifying the technical consistency of the Original Materials. Okodia shall do everything in its power to correct these defects in the translation. 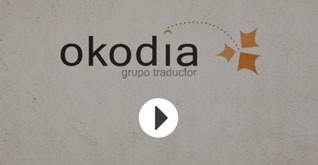 However, the Customer accepts the fact that a translation may not have the same nuances as the original text, so Okodia shall not be held liable as regards any alleged lack of advertising, commercial, or image impact, or any other problem derived from initial mistakes committed by the Customer. The Customer shall clearly and expressly specify to Okodia the purpose of the translation; otherwise, its purpose shall be understood to be informational and understandable by the Customer. In particular, the Customer shall specify whether the translation is meant to be part of final documents in Tenders, Agreements, Patents, Publications, Electronic Publications, or any other use. Should the Order be used for a different purpose than specified by the Customer when requesting the price quote, the Customer shall notify Okodia as soon as possible for authorisation or confirmation of the suitability of the translation to its new purpose. In case of disagreement regarding the terminology, Okodia undertakes to try and find, in good faith, the solution that best suits the Customer’s demands and to make adjustments as soon as possible. However, the contents of the entire document shall not be questioned. Should the Customer fail to explicit make a complaint on reception of the translation, it shall be regarded as complying with the order, both in qualitative and quantitative terms. In the case of Urgent work, Okodia reserves the right to abstain from performing certain stages in the quality control process in order to comply with the Customer’s deadline. The Customer accepts that this might lead to a decrease in the quality of the work delivered. Okodia shall in no way be held liable for this decrease in quality. The Customer shall notify Okodia in writing of any complaint regarding the Provision of the Service within thirty (30) calendar days from Delivery. In addition, the Customer shall provide arguments regarding the contents as well as a detailed description of the complaint or potential translation mistakes (specified in point 11 below), referring to glossaries, dictionaries, usual practices in the industry, etc. If the complaint is justified, Okodia shall proceed to proofread and correct the Order in its entirety or partially at no extra cost, within a reasonable period of time. In this case, it may offer the Customer a discount for the inconvenience. Should the Customer have failed to file any complaint after the period established beforehand, he shall be understood to accept in its entirety and with no reservations the Final Materials delivered, and Okodia shall not be held liable or obligated for any potential translation/proofreading/localisation/layout mistakes. Any complaint filed afterwards shall only be processed if Okodia accepts it in good faith. After this period, Okodia shall continue to be liable for any mistakes which the Customer can prove to have been intentionally or due to negligence, and which he was unable to reasonably identify during the period stipulated after Delivery. Okodia shall be completely exempt from this liability one (1) year after delivery to the Customer. The Customer shall regard the records in Okodia’s systems pertaining to conversations between Okodia and the Customer as fully valid, unless otherwise proven. The filing of a complaint shall not exempt the Customer from his payment obligation. – translations the meaning of which is clearly mistaken. – disagreements pertaining to the terminology used, unless the Customer has provided precise information and instructions in this respect. Okodia shall be exempt from any liability in the event of mistakes due to a mistaken or ambiguous terminology or text in the Original Materials or in the instructions. Likewise, Okodia shall not be held liable for any corrections or changes to the Order made by the Customer or any other person after Delivery. Okodia shall be liable for any direct damages to the Customer for a total maximum amount equal to the amount received for the Order. In any case, Okodia shall not be liable for any indirect damage or for any damage resulting from any direct or indirect damage derived from complaints filed against the Customer by third parties resulting from services provided by Okodia. This limitation, however, shall not apply in those cases in which Okodia acts deliberately in bad faith or negligently. The Customer undertakes to send Okodia only copies of the data to be processed; under no circumstances (unless strictly necessary) should it provide the original copies. Okodia shall not be held liable for the return, loss, of damages suffered by the Original Materials. Should the Original Materials delivered to Okodia be unique or valuable, the Customer shall be responsible for purchasing a suitable insurance policy to cover potential damages arising from total or partial loss or destruction of said materials. Okodia has a professional Civil Responsibility insurance policy covering potential damaged for a maximum of EUR 300,000 in the event of an accident, for a maximum of EUR 300,000 per year. Okodia uses antivirus software and firewalls to protect itself against potential computer attacks; however, it shall not be held liable for any damages caused by the potential transfer to the Customer of viruses, worms, trojans, spyware, etc. The Customer is obligated to verify that the computer files are free of any viruses or harmful codes before delivery to Okodia, and also undertakes to verify the cleanliness and integrity of the computer files received from Okodia before use. In the event of infection of our computer equipment due to causes attributable to the Customer, Okodia reserves the right to cancel delivery totally or partially. The Customer making the Order (accepting the price quote) is ultimately the sole party responsible for payment of the services purchased, even if he is not the final recipient of the Order or if it makes the Order on behalf of third parties. in the event of a fraud or risk of default. The Customer accepts that Okodia will issuing the invoices for the service in electronic format (PDF file via email). Invoices shall include the applicable taxes under the law in force. Unless the parties stipulate another payment deadline and method, payment shall be made by bank transfer into the account specified by Okodia within thirty (30) days after the invoice is issued (exchange and transfer rates, etc. shall be assumed by the Customer). In the event of breach of the payment terms and conditions described above, Okodia reserves the right to suspend its service, and the Customer shall be unable to file any complaint for this reason. Application of this clause shall not exempt the Customer from payment of the invoices owed. Unless otherwise specified, Okodia shall hold all the ownership, use, exploitation, and authorship rights in exclusive until the invoice is fully paid in accordance with the payment terms and conditions specified in the quoted price, the invoice, these general terms and condition, or any specific terms and conditions in every case. When this payment is made, all these rights shall be automatically transferred to the Customer. The Customer also recognises that the translations performed by Okodia constitute new documents copyright over which shall belong both to the author of the original document and to Okodia until the payment stipulated is made as previously described. Without prejudice to the foregoing, in the event of artistic or literary services, and without prejudice to rights over its work, Okodia reserves the right to demand that its name be mentioned in every copy or publication resulting from its services. In this respect, total or partial use of an Order which has not been fully paid under the payment terms and conditions agreed and accepted shall constitute an instance of unlawful use and misappropriation, in which case Okodia reserves the right to claim immediate payment of the Order, and, if applicable, copyright compensation, as well as the right to take legal action against the infringing party using all the legal and administrative means available. Regardless of the stipulations above, the Customer acknowledges that Okodia is the only and exclusive holder of all the rights pertaining to any a) inventions, methodologies, innovations, data, software, and databases used or developed during performance of the Order by Okodia. Okodia undertakes to maintain the confidentiality of any information of which it becomes aware, both before, during, and after the provision of its service. The Original Materials shall be returned to the Customer at his request. Okodia guarantees that both its employees and its partners have expressly accepted and signed a confidentiality clause, and they work in accordance with the code of ethics of their profession and in good faith. Okodia shall not be held liable in the event of the interception or deviation of information during data delivery online or by any physical means. Thus, the Customer shall indicate in advance or when making the Order which delivery means it wishes Okodia to use in order to ensure the confidentiality of any sensitive information. Before sending any document or information to Okodia to make the Order, the Customer shall ensure that it is authorised to do so. Thus, the author of the original author shall make the delivery or prior authorisation in writing shall be obtained from the holder of the copyright over the documents in to make the Order in question. Otherwise, Okodia shall not incur in any liability if all or part of the documents entrusted by the Customer breach third-party rights of intellectual property or of any other kind or the applicable legislation. If applicable, the Customer shall assume any potential damages and financial losses derived from his negligence. The Customer authorises Okodia to store and use the Original Materials and the Final Materials during the term of the agreement with the sole purpose of providing the services ordered. Without the Customer’s explicit authorisation in writing, Okodia shall not be authorised to publish, disclose, or delivery any confidential data to third parties, with the exception of partners authorised by Okodia, whose operational or consulting role requires access to these data in order to fulfil the Order. The provisions in this paragraph shall not apply when Okodia is required by law no disclose these data or when it belongs in, is derived from, or enters the public domain without Okodia’s having previously disclosed it. Likewise, the Customer authorises Okodia to perform commercial or marketing actions related to the nature of the Order without disclosing any sensitive or confidential information or any information that might damage the image of the Customer or cause any direct or indirect damage to the Customer or its customers. In order to fulfil the Order, Okodia is authorised to employ and outsource work to partners, qualified third parties, and independent translators/proofreaders/layout designers, etc. who in turn are subject to the duty of professional confidentiality. Unless otherwise stipulated in writing, Okodia may consult with experts related with the topic of the Order in order to fulfil the Order with guaranteed quality without disclosing sensitive or confidential information. Any contact between the Customer and the third party to whom the Order has been outsourced by Okodia shall be subject to explicit authorisation in writing from Okodia. Without Okodia’s explicit authorisation, the Customer shall not be authorised to contact the professional(s) fulfilling the Order requested by the Customer, either for the current Order or for future Orders, for a period of three (3) years from the last Order assigned to Okodia. The duty of confidentiality shall remain in force after the end of the contractual relationship. Furthermore, unless the Client expressly requests otherwise, the Client authorizes Okodia Group to reveal the Client’s identity and logo among Okodia’s commercial references, commercial documentation and website. This free authorization does not grant Okodia any right with regards to the Client’s name or logo. These rights shall remain in all cases under the exclusive property of the Client. His personal data will be included and processed in the personal data files owned by Okodia, in order to manage the service purchased, for internal use, for promotional purposes, and for operational purposes, as well a for administrative, financial, and accounting management of the provision of said service. Okodia may transfer or assign his data to other companies related to the provision of services or its affiliates, for the purposes stated above (i.e. partners, financial institutions, advisory services, etc.) in the terms stipulated in said Law. The Customer may exercise his rights of access, rectification, cancellation, and objection in the terms established in the legislation in force, by sending a message to Okodia at its registered headquarters by any means that allow recorded delivery. Likewise, pursuant to the provisions in article 22 of Law 34/2002 of 11 July on information society services and electronic commerce (LSSICE), Okodia informs the Customer about its intention to send him commercial communications by email or by any other equivalent means of electronic communication. If the Customer does not wish his data to be processed for the purposes described above, he may specify it in writing in any of his communications with Okodia. Okodia reserves the right to amend its General Terms and Conditions for the Provision of Services at any time, with no previous notice. Likewise, he undertakes to make the updated General Terms and Conditions available to the Customer through its website. Any new version of the general terms and conditions for contracting shall invalidated those previously given. Okodia SLU’s domicile is C/ Núria 57, 08191 Rubí, Spain, and for purposes of notification, Apdo. de correos 37007, 08011 Barcelona, Spain. The Company is registered in the Mercantile Registry of Barcelona, Volume 42860, Page 153, Sheet B 416235, Entry 1 – Tax ID No. ES-B65659963. For purposes of notification, the Customer’s domicila shall be regarded as the one specified in the Customer’s Okodia file, in accordance with the data provided by the Customer’s authorised staff. The Terms and Conditions for Provision of Services shall be governed by Spanish Law. Okodia, their legitimate owner, and the Customer expressly waive any other jurisdiction to which they might be entitled and subjec themselves to the jurisdiction of the Courts and Tribunals of Barcelona (Spain).